Large turnout opening of Aldbourne Community Centre for young people Wiltshire Gazette and Herald 29th September 2013 Youngsters were out in force on Saturday as the doors to Aldbourne Youth Council’s new home officially opened. Community Junction is a youth and community centre managed by young people and includes facilities such as an after-school café, a youth community room, and a chill-out area where the 13-plus age group can socialise. village in 2011 with the backing of local businessman and estate owner Brian Kingham. It has been working on refurbishing the building since November last year thanks to a number of grants, including £50,000 from the Hill’s Group, and their own fundraising efforts. Ms Keen said: “It was great to have the backing of Mr Kingham because although we had a great idea, without his financial support we wouldn’t have got anywhere with it. 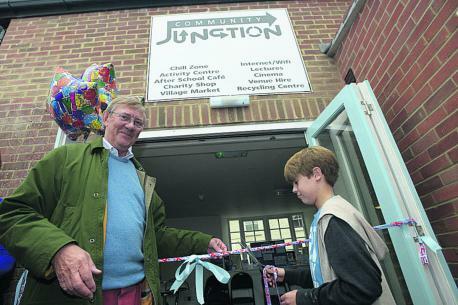 “We decided he would be the most appropriate person to open Community Junction because of all the support he has given us, and he cut the ribbon with his youngest son. “We started the refurbishment in November so it’s been a quick turnaround. “We didn’t get our first big grant until June last year and it’s just snowballed from there.” Although the project will be overseen by adult trustees, young people will help to run a charity shop and a two-bedroom holiday let to raise funds and gain work and life skills. Ms Keen said: “This would be a great scheme in any community because it’s going to be self-sufficient. “Not only will the holiday let and shop teach the young people how to run a business, they will also provide funding. This means we we don’t have to rely on grants. 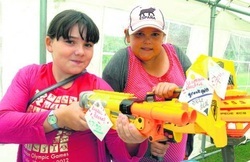 Aldbourne Youth Hub is right on target! Story by Nigel Kerton, Wiltshire Gazette and Herald published, 21st June 2012; page 2. A huge debt faced by Aldbourne Youth Council for the refurbishment of its youth hub has been paid off before the builders move in. 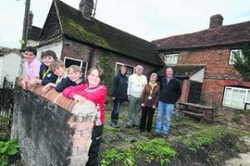 With backing of local businessman and estate owner Brian Kingham the youth council paid £300,000 for the semi-derelict building in the centre of the village which will be known as the Community Junction. AYC has a 25-year lease on the building at a peppercorn rent. Click Here to Read the Full Story! Click Here to Read More About Community Junction! MEMBERS of Aldbourne Youth Council showed off their new £300,000 premises in The Square on Saturday when they held an open house. 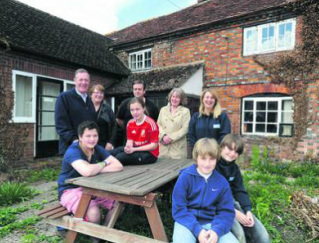 The youth council has been able to acquire the group of cottages and shops in the centre of the village thanks to generous sponsorship from local landowner and businessman Brian Kingham. 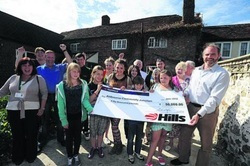 Mr Kingham has funded the purchase of the building, said AYC adult trustee Andy Devey. “He has put the buildings into a trust for as long as the youth council wants it or until such time as the youth council is no longer. “The arrangement is that we look after the refurbishment and maintenance,” said Mr Devey, adding that it was estimated it would cost £100,000 to get the buildings into good shape. AYC has already raised £2,500 which includes a donation for half that amount from the Blue Boar who held an auction and split the proceeds between the youth council and St Michael’s Church. On Saturday members of AYC asked villagers for ideas of how to raise funds and also for ideas on what to do with the building for the benefit of all ages, not just the village’s young people. The AYC is for young people aged between eight and 18 but, said Mr Devey, it wants to share the premises with other age groups. Currently youth council members use the CAN, part of former public conveniences they rent from the parish council, and have created an internet cafe where people of all ages learn how to use computers. 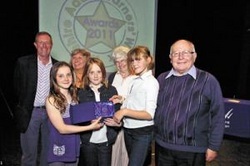 The national award-winning AYC needs somewhere bigger, said Mr Devey. “We have outgrown the CAN and need more space, especially for the older teen-agers who, dare I say it, are out on the streets. Ideas put forward at Saturday’s open house included moving the village library from its present cramped premises into one of the empty shops; creating a cafe; and possibly using one of the larger rooms for Saturday morning cinema for young people. 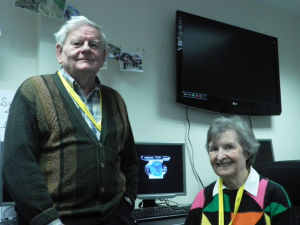 Mr Devey said the AYC would be seeking grants and funding and one of the first agencies it would approach was the Marlborough Area Board of Wiltshire Council. “We want to be in that building and have it in use for all sections of the community as soon as possible,” Mr Devey said. Here's a list of news articles about us! Click on the names of the headlines to read the articles! Click Here for the full Gazette and Herald Story by Nigel Kerton published August 2012 and see our Facebook page for more fantastic photos of the day! Click on dark text to take you to the Newspaper website for the full story. Report on the confusion between AYC's first temporary site. The Youth of Today- In Aldbourne they’re something to aspire to! Aldbourne wins Calor Village of the Year largely due to the facilities at the CAN. Report on AYC winning the Philip Lawrence Award for the BMX project.